Improved Online Forms, Appointment Confirmations, Updated Email Templates & More. Product Update: Kalix now supports appointment confirmations (Appointment Notices), improvements to online forms & updated email templates. The addition of a form Submit button for clients. A form completion email notification for you. An extension to the time window, clients (or invited parties) can access forms. Now it is 14 days. A number of you, have also requested a round up of recent updates to Kalix. Here’s is a summary of major releases and improvements made over the last few months. Kalix's Medicare PQRS Registry was launched in May. It will almost automate the PQRS reporting process for you by identifying all eligible clients and appointments, as well as the appropriate measures to record. And it is not too late to start, Qualified Registries like Kalix submit PQRS data at the end of the reporting period, reporting is unrelated to billing. Participation can start at any time within the 2016 reporting period, up to just before the end of data submission period (January 1 2017 to March 31 2017). For more information please click here or contact us. 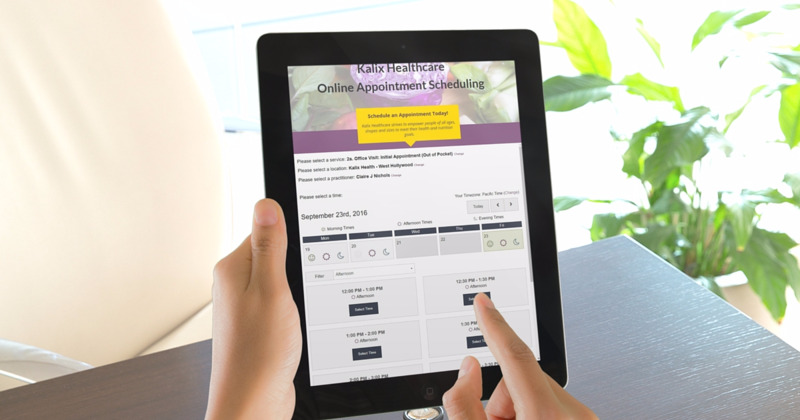 Kalix's Online Scheduling feature allows you to add a widget to your practice's website, so that you can accept bookings 24/7. All bookings will sync with your Kalix appointment calendar, client files and automated reminders. Kalix's online scheduling is supported on PCs, Macs, tablets and smart phones. Click here for additional info. Kalix's Appointment Notices (or appointment confirmation) feature was released at the same time as online scheduling. These reminders are sent when you create a new appointment, confirm a tentative appointment (created via the online scheduler),and each time you edit an existing appointment's details. Kalix's appointment reminders are fully customizable, you can choose the reminder method used (email, text message or text-to-voice) and the contents of reminder message itself. Click here for further information. An appointment details summary and appointment location map (appointment notices and reminders only). An email unsubscribe link and link to sender (Kalix) (for SPAM prevention). We have released improvements to Kalix's online forms including the addition of a Submit button for clients and a form completion email notification for you. The window that clients (or invited parties) can access forms was also extended to 14 days. Click here for more details. Blockout Days - to schedule out public holidays and other days that you are unavailable to take appointments. General Doc Uploads can now be accessed by all users (with any access level). The email message field text field for online forms now contains a text editor. The subject field for email reminders and online form's email messages now support merge fields. We hope you enjoy these improvements to Kalix. There will be a lot more updates and new features coming soon. We are currently working on a brand new in-template editor for custom terms, the ability to email bills within Kalix and the functionality to download a specific client's documents into one file. We use your feedback and suggestions via our our feedback page to decide on what we work on next. Take a look some time and vote for your favorite ideas.